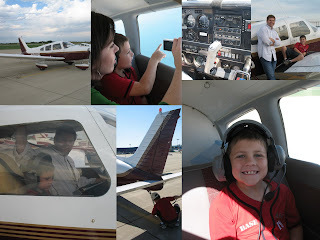 Jake and I got to do something pretty awesome today, we went on a small plane ride around the city! We have some friends that own their own plane and they invited us to go up with them. We started out by flying over our apartments then headed to the city. 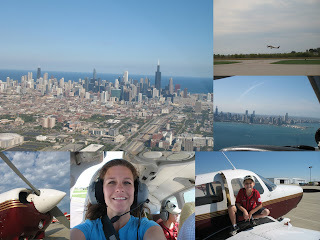 We flew over lake Michigan to see the view of the city from that angle and it was gorgeous! The sky was clear and sunny. We couldn't have asked for better weather. We flew back to the airport after flying by the city a couple of times and Todd (he owns the plane) dropped Natalie (his wife) and I back off and took Jake up by himself. They were gone for about a half hour and Todd let Jake fly the plane. Jake even did a 360! Jake thought it was the coolest thing ever!!! Our whole trip (before Jake and Todd went by themselves) took a couple of hours and it was AWESOME! I have to say that this experience ranks pretty high on my list of coolest things that I've ever done. wow... supercool. i don't mind the big jets... but smaller planes really get my acrophobia going.. So cool!!! I'm jealous...that looks like so much fun!!! What a blast! How fun for you guys!